We like to read comics. 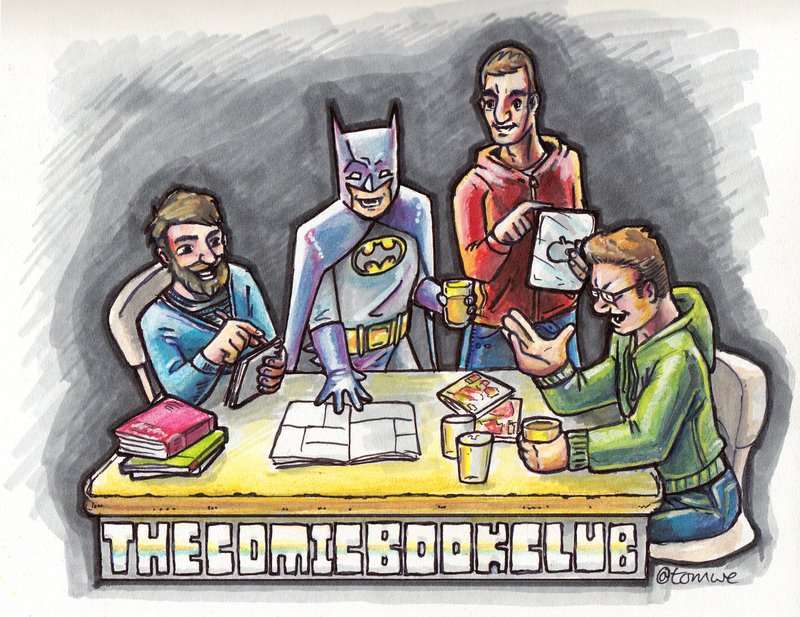 Happy New Year from The Comic Book Club! 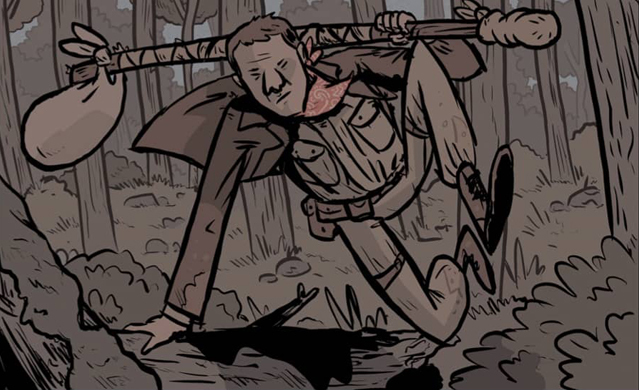 My last choice of 2018 was Kyle Starks’ eight issue miniseries Rock Candy Mountain from Image Comics. I knew nothing about the series going in; I liked the title as it made me hum the tune featured in O Brother, Where Art Thou? whenever I read it. Pretty quickly I realised Starks was also the creator of Sexcastle, a book The Club had read on the side at my suggestion before. Sexcastle was very much a one man creation whereas Rock Candy Mountain has the addition of colours by Chris Schweizer. 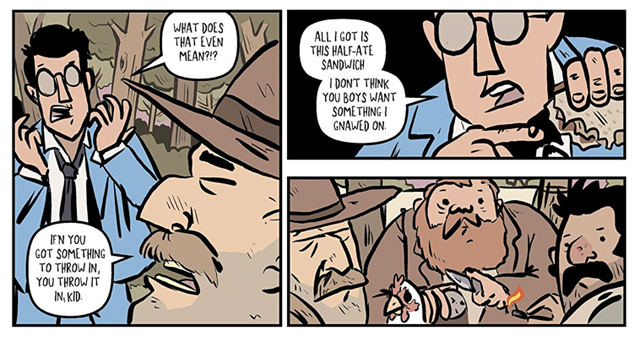 Rock Candy Mountain is about hobos, hobo life and one hobo’s quest to find the titular mountain. See, he knows the way. It is very much a comedy book with some fantastic laugh out loud moments, crazy characters and artwork that falls squarely in the ‘cartoony’ category. Starks packs a huge amount of content into his issues and the action keeps on chugging along throughout, picking up pace in the second collected volume as we learn more about the protagonist Jackson and why he is on his quest. Dan was apprehensive about the book and found the art off-putting. Cartoony really isn’t his thing and he took a particular dislike to Jackson’s nose which annoyed him intensely. He read volume one without paying much attention but luckily came out thinking he’d enjoyed it! He thought the brown colour scheme was very much the colour-way of the Deep South, matching that found in Jasons Aaron & Latour’s Southern Bastards. When your overall theme is Sweaty Brown it’s easy to make things pop with other colours such as token non-hobo Pomona Slim’s blue suit and the burning reds of The Devil. 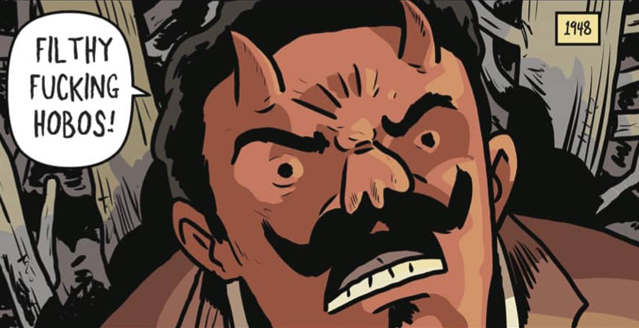 Yes, The Actual Devil features in this comic. Jake said the book was a quick read too and had time to return to the first volume after having completed the second. He found Starks’ portrayal of ultra-violence didn’t mesh with the style of the art and also had an issue with Jackson’s nose. He thought the set pieces in book two worked better but overall wasn’t too interested in the quest aspects of the story. He would have liked to have seen more of Pomona Slim and for his arc to have been rounded out better. For me the cartoony art is bang on the money and I see a touch of Pixar artist Scott Morse’s style in Stark’s drawings. The storytelling is clear and the comedy right-on. The only aspect I didn’t like falls into spoiler territory so quit reading now if you’re looking to read yourself: la de dum de dee filling a line with junk just to make sure you don’t accidentally read the next section de dum de doo. The flashback section which opens the second book was a great way of filling the character’s backstory but I feel using Hitler and the Spear Of Destiny is rather old hat and has been seen lots of times before. Here it’s a mcguffin and the Deus ex Machina which gives Jackson a way to defeat his foe. Maybe that’s just Starks’ writing style - play off the recognisable in a humorous way. It certainly worked in Sexcastle, which was the most nineties action movie ever. Like a fair few of my comic book reading brethren, my first experience of Matt Wagner’s work was through his epic Grendel saga. The ever-changing rota of artists, including Wagner himself, lent Grendel an unpredictable, underground aesthetic that veered from precise black and white to day-glo 80s futurism and dark, disturbing surrealism. It was while reading Grendel, first published by Comico and later by Dark Horse, I saw that Wagner had another long-term project simmering away on a back-burner. 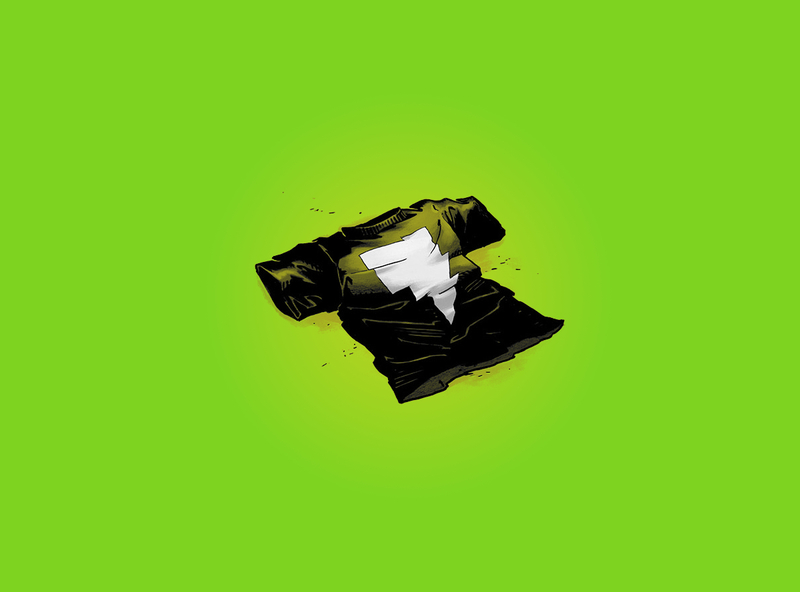 Ads in the back of my Grendel monthlies had some bloke in a neat lightning icon t-shirt waving what looked like a glowing, magical baseball bat. The book was called Mage. I was curious, and that t-shirt was awesome, but not enough to follow it up. As the years passed I continued to hear bits about Mage, often couched in glowing terms like ‘a masterpiece’ and ‘the single greatest comic book about magic baseball bats ever printed’. I figured I’d probably give it a go sooner or later. It took 20 years but here we are. Tom actually had the whole run of single issues re-printed by Image in the early 00s. They weren’t the best quality, printed on stiff, crunchy paper and oddly bound. 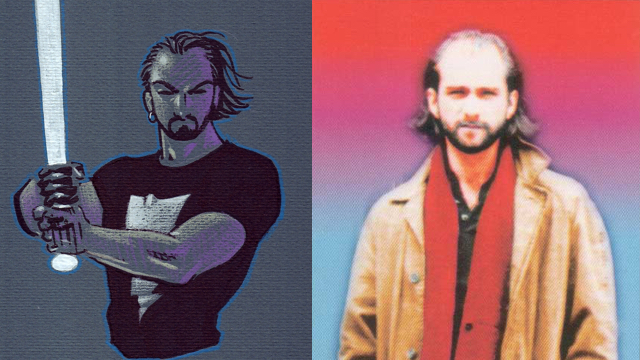 They were also digitally re-coloured using a sharper, more acid palette than the originals. Jake had never heard of Mage before and hedged his bets by going digital. His digital versions fell somewhere inbetween Tom’s gaudy 00s floppies and my shiny 90s softback volumes. I was really rather broadsided by how loose, scruffy and unpolished Wagner’s art is in Mage. It’s clear that this is right at the very start of his comics career and that, although obviously talented, he’s still finding his way with composition and pacing. Tom was onboard with the raw styling but bemoaned the dodgy digital colouring in his reprint editions. The cheap shiny paper in my collections exacerbated some rather eccentric colouring decisions in the earlier versions too. Jake wasn’t too fussed either way. 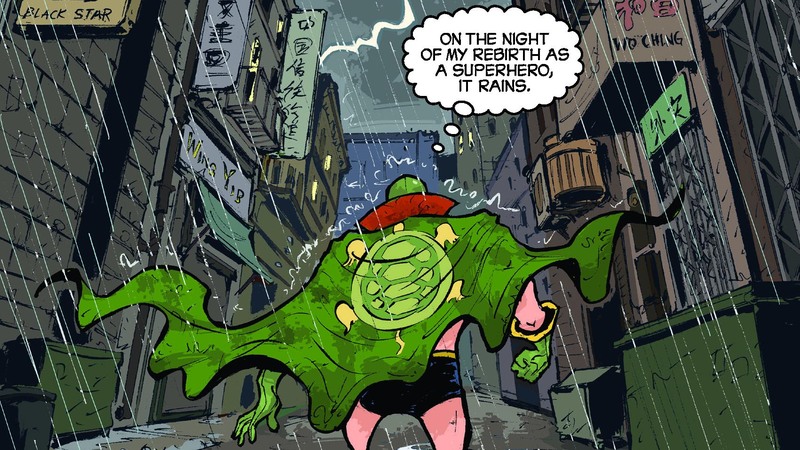 The art style seemed vaguely familiar and he really enjoyed the expressive hand lettering throughout. 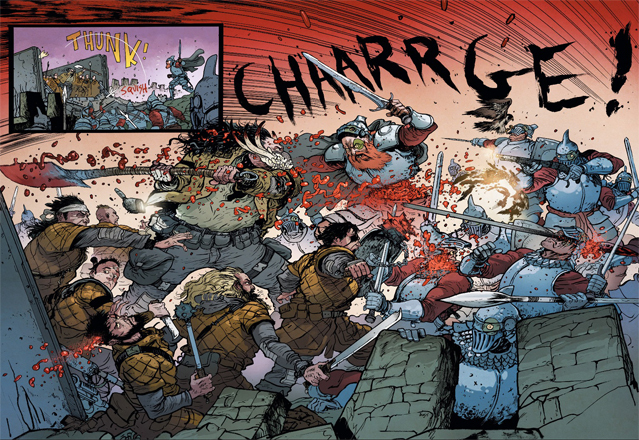 The story itself is a bizarre mash-up of Arthurian myth and blue collar Americanisms. While fairytale whimsy isn’t really my thing, I’m a sucker for people smacking trolls with magically-imbued sports equipment so I tried to get on board with it. The disparate pieces didn’t quite come together for Jake - the fantastical parts sitting too jarringly at odds with the grittier real world elements. There’s also a heck of a lot of exposition gumming up what should be a relatively simple story. Wagner tries to flesh out his characters beyond their clichéd fairytale roots but it doesn’t quite get there. Where a more experienced storyteller might have made something more dynamic, Mage starts to drag and never quite escapes its own self-importance. Aside from the main protagonist - Kev Matchstick - a couple of the supporting characters drew mixed opinions. Tom and I found Mirth, the magical hippyesque Merlin-figure, excruciatingly annoying in his language, mannerisms and general smugness. Jake was a little kinder, citing Mirth as the only thing actually pushing Matchstick onwards towards some kind of character development. Kev’s ‘Foxy Brown’ blaxploitation sidekick Edsel, the initial wielder of the magical baseball bat, comes across as a clumsy anachronism and rather out of place in this day and age. And what of Kevin, the titular Mage himself? 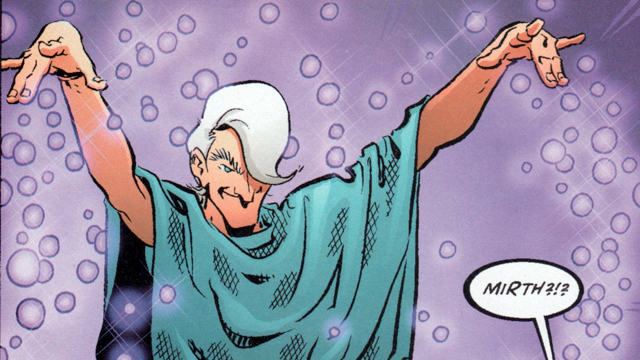 It’s been suggested that Mage is intentionally autobiographical and that Kevin is, to all extents and purposes, Matt Wagner. They certainly look alike. 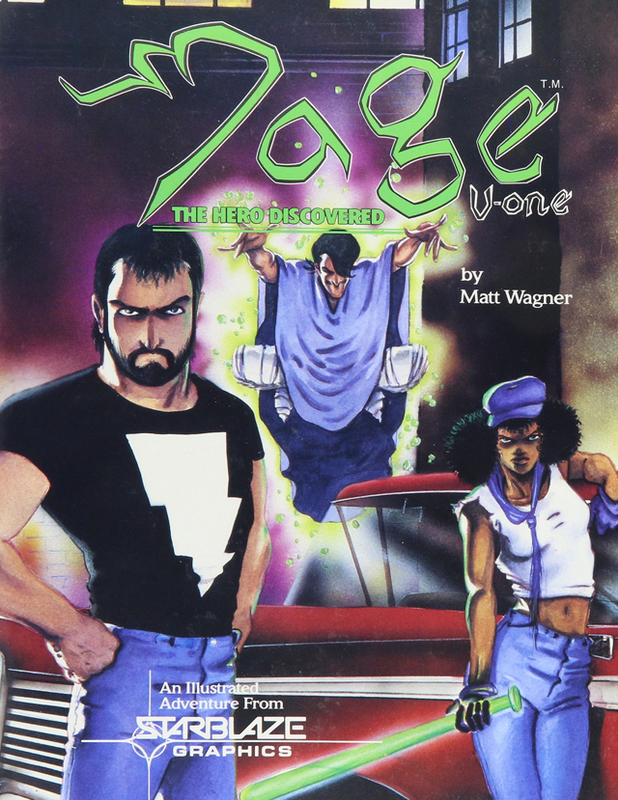 It’s hard to shake the feeling that Mage is just Matt Wagner’s life with some added Pendragon. Jake really couldn’t warm to Kevin, finding him an unpleasant character who acts like a spoilt teenager throughout. Lets hope Jake and Matt never meet in person. Rounding it all up there’s a seriously weird bit at the end of volume 1 where Kev confesses to Mirth that he killed a dog. It’s an uncomfortably personal anecdote that feels like a genuinely guilty confession used as a narrative device. Given the autobiographical nature of Mage it leads me to wonder whether Wagner actually did kill his own dog. Jeez, that’s a horrible thought. I still want a Mage t-shirt though. They’re mint. Why can’t he draw necks? Did Matt kill his own dog? It’s fair to say that when I’m looking for a book to pick, I look to the art first. In the case of Extremity I was looking to Daniel Warren Johnson’s (DWJ) Instagram posts and in this case I was blown away. 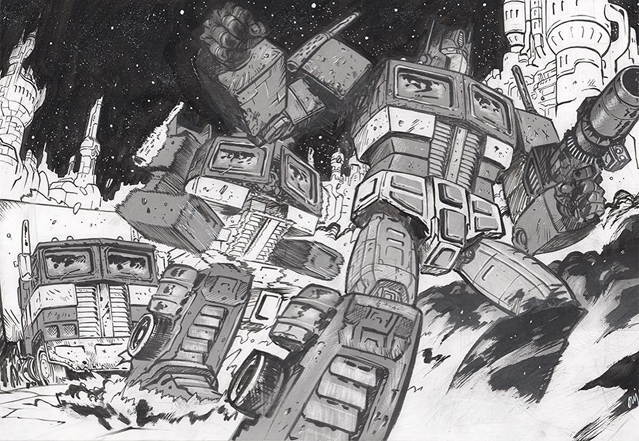 He had some fantastic fan art of Transformers and Star Wars, two franchises close to my heart! He has even drawn a mini-comic called Green Leader that you can read online for free and as of yet he has not been sued by Disney. It’s that good. 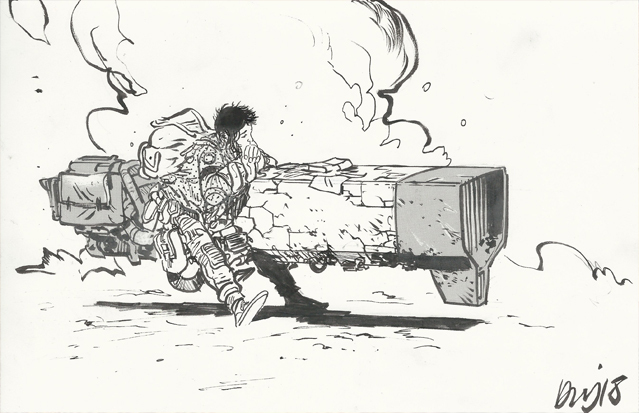 I heard of his webcomic Space Mullet via the 11 O’clock Comics Podcast, who did a great interview with him prior to working on Extremity (here), and was keen to see if his storytelling matched up to his artistic chops. 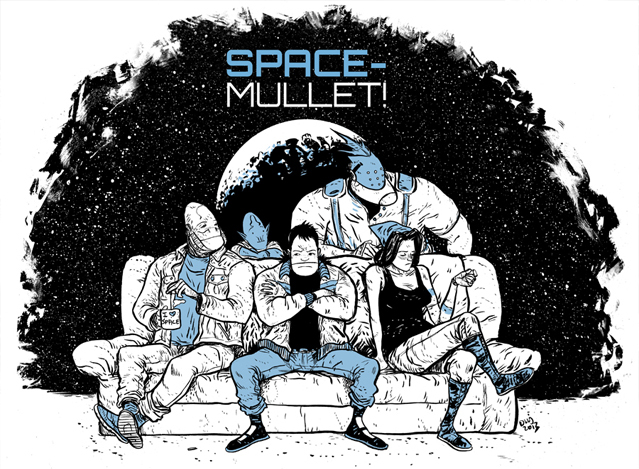 Space Mullet I decided would be a harder sell to the group, not least because it is incomplete: the Dark Horse Edition is only half the story and due to his paid endeavours he is yet to wrap up the online serialisation. 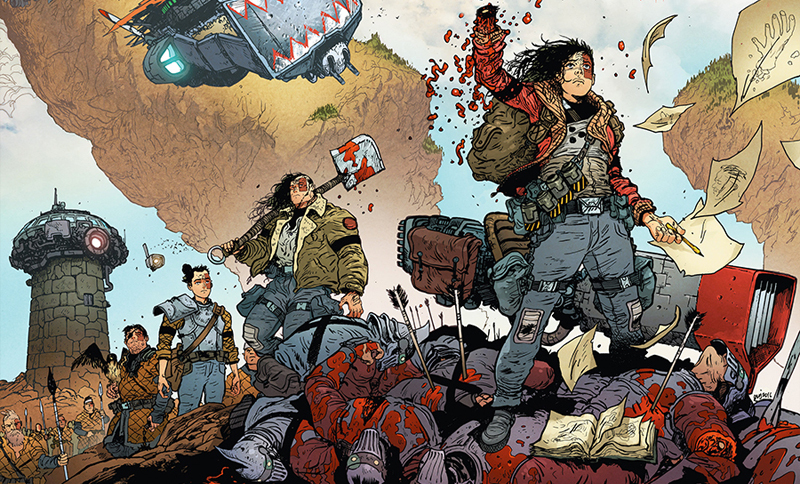 I was fortunate that the timing of my choice coincided with the release of the second Extremity TPB so the option was there for people who wanted to read the whole thing in that format. Dan it turned out had read the first issue before as part of a Humble Bundle, but had very little recall as it was jammed in with a whole bunch of other stuff from that deal. Jake was lucky enough to find a comixology sale in time for our meetup so he was able to complete the story as well. Reading the book it’s immediately clear how strong DWJ’s handle on the medium is. There’s no rules to his page layouts; he knows when to work a grid, when to go dense and when to open up for a grand reveal. And oh those splash pages are gorgeous to behold! All of which is rather sickening when you realise he only started working in comics earlier this decade. Jake and I were waiting for Dan to cite the Paul Pope influence on the art style and although he did, it was as a compliment. He loved the grungy character designs, especially Jerome with his Death Spade and mask of teeth. 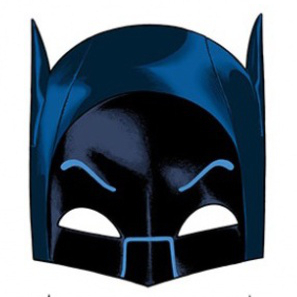 Jake pointed out that Pope’s Batman 100 featured a mask of teeth as well. I called out the manga influence in the speed lines and character faces but later also learnt that specifically Appleseed is a big influence for him. The technique of rendering in a distorted manner can be seen in that Manga. I found that particular touch to be a visual boon on top of DWJ’s ability to draw just the right moment in each panel, emphasising weight, impact and reactions in the characters. There’s also a fantastic use of drawn sound effects on almost every page, be it a small toss as a book is discarded, the WH-TONG of a knockout hammer to the head or SPLUTCH as a monster is cleft in two. It’s just another part of what makes this a real comic-booky read. In this book DWJ has built a fantastic world. It appears to be a long distant future of our own, and there are some nice Easter Eggs that show this to be the case. Dan thought it was a labour of love. Just the creator with his excellent colourist Mike Spicer putting together this tight twelve issue story with no fat and a whole lot of unique touches. Jake saw echoes of Mortal Engines with its Steampunk cities. Extremity is definitely a Post Tech world. Despite his usual dislike of giant robots, Jake thought this story earned its use here. The robot is just one combattant in the over-the-top action, joined by flying lizards, battering ram sky ships and other creatures from the depths of legend. 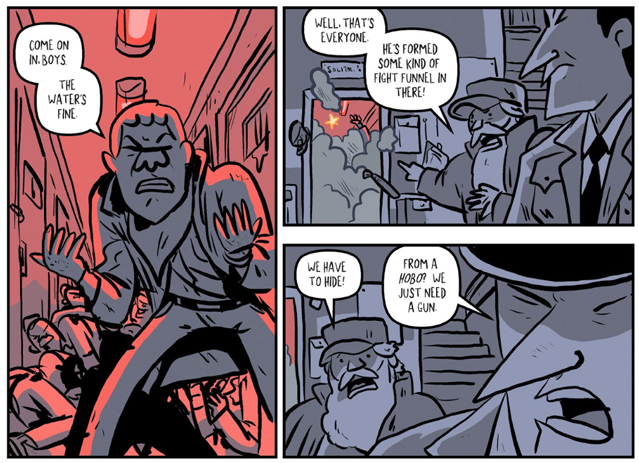 I read the two volumes on full tilt, it is very easy to follow the flow and get caught up in the action. By the time I got half way through the second volume though I was in need of going back and starting again. There is so much good stuff it would be a crime to miss it! Dan was concerned that the ending came around too quickly. He knew the final moments were upon him due to the length of the book but thought there was still much more that could be said. Jake thought there was lots of opportunity for other stories in the same world. Maybe DWJ would return for more spin-offs after his next project. Perhaps a Tales Of… with other creators drawing their own versions under his guidance. *I am giving this book full marks due to the sheer exhilaration of the read. As a fan of science fiction, coming of age stories and rampaging monsters I can barely fault it. 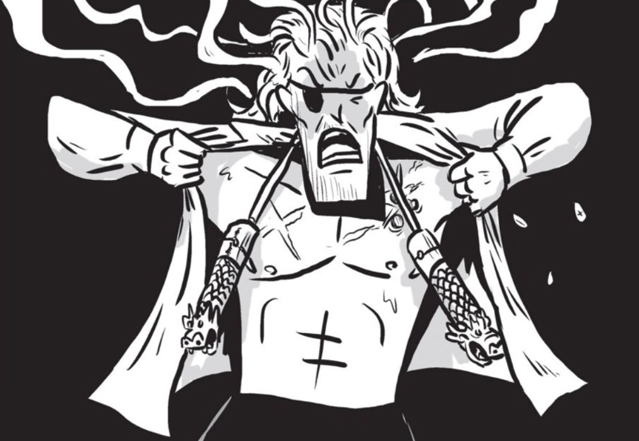 I will be looking immediately to DWJ’s next project: MURDER FALCON! It’s a full-on fantasy thing. I rarely read books a second time but I will in this case, there’s so much to discover. It lacks humour and for that I won’t give it 5 stars but this is not a photocopy of something else, it’s a bunch of indulgence. Author’s note: While formatting this article it occurred to me I completely forgot to mention the fact we have a female lead here. I tend to gloss over the specifics when I write reviews but wanted to point to this aspect in particular given the number of action heroines appearing in SF today. Thea is a complex character coming into leadership with conflicted turorship from her grieving father, and a brother who appears to be forging his own path. She is a girl whose story is worth following! It’s pretty rare that we get an almost complete consensus on a given book given our wildly varying tastes and interests. 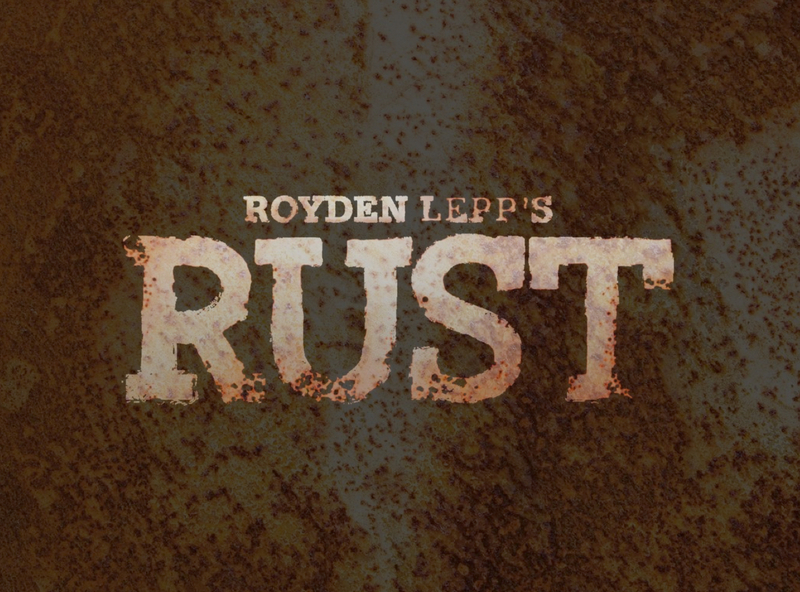 I can proudly say that my latest selection, Rust: Visitor in the field by Royden Lepp, managed just this. To a man, we all agreed that this book is very, very brown. We were browned out after page 2. Not a great start. We were mostly in agreement on other aspects of the art in Rust. I couldn’t help but find it derivatively angular and not very exciting. I’ll admit to kinda liking the design of the steampunk-style giant robots. No one else did though. Jake rounded on the artist’s (over)use of a single Photoshop motion blur effect and a lack of dynamism in general. He wasn’t very impressed with some of the faces, one scene depicting dinner around a farmhouse table eliciting the statement “That’s one of the worst faces I’ve ever seen”. Tom spotted that the whole thing is laid out and designed like an animated cartoon, betraying Lepp’s origins as an animator. 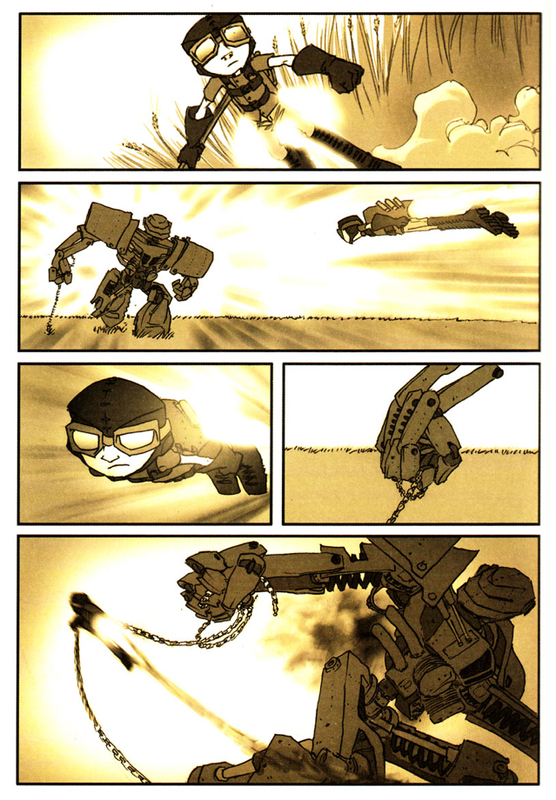 When Tom, an animator himself, pointed out that the book is essentially set out as an animation storyboard it suddenly became clear why there are so many redundant panels or overlong sequences for minor actions. The action in Rust feels drawn out and in slow-motion as if Lepp can’t break free of detailing every change of camera-angle in a sequence lasting a few seconds. Unfortunately, what works in animation frames is lost in comic book panels as the reader wades through treacle before anything happens. Tom also took issue with another of Lepp’s apparent hangovers from his animation past. He felt that every character, from small-town farmhand to giant war robot, was copied from a 3D reference model, posed each time. To Tom this is a ‘lazy’ approach resulting in visually consistent but mechanical, lifeless art. The book itself is a remarkably brief and ephemeral read. We all blitzed through it in under 20 minutes, finding little of substance or originality to hold on to. There are many hints of other, better, books such as Astro Boy and Big Guy and Rusty the Boy Robot, it was hard not to want to sprint to the end and read those instead. Jake persevered and read volumes 2 & 3, mainly because they were cheap digitally and just as quick to read as this one. At the end he still wasn’t convinced. And everything is still brown. Too short, too brown, too little substance and too much like a lot of other, better things. 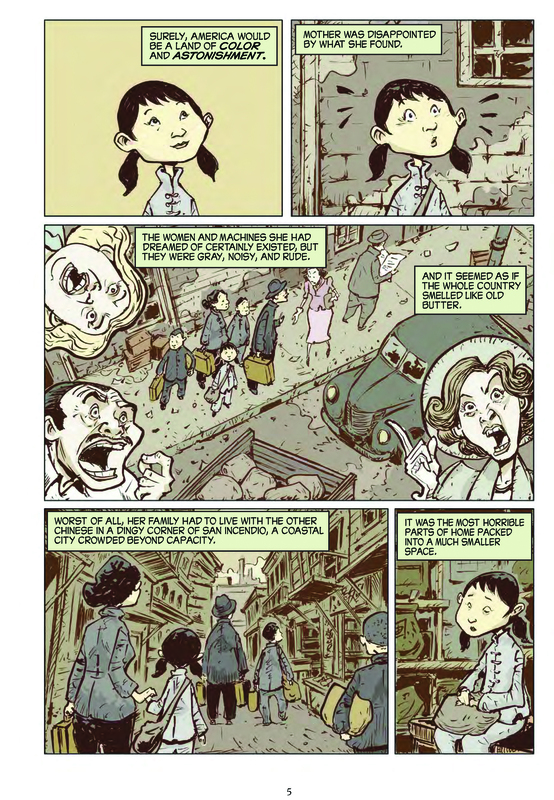 Maybe read if you find them all cheap on Comixology and you really like brown. Note: Kelv couldn’t make the meetup but provided a brief summation of his thoughts and a score at a later date. The (Western?) 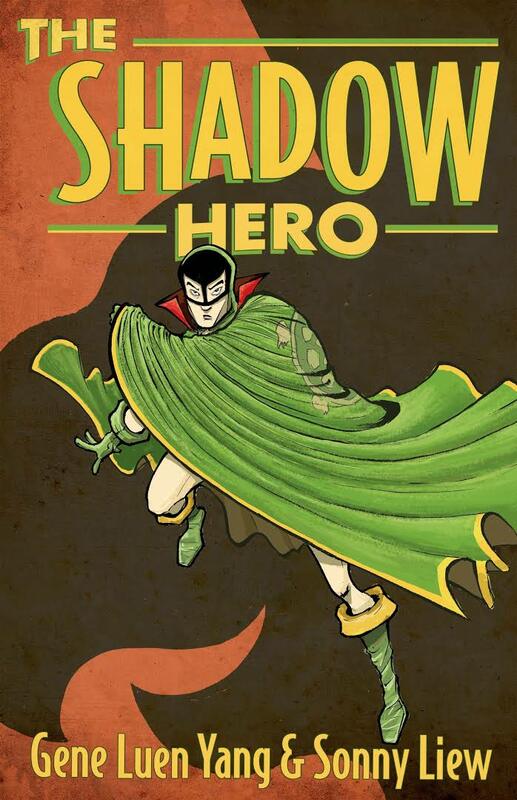 World’s first Chinese superhero! 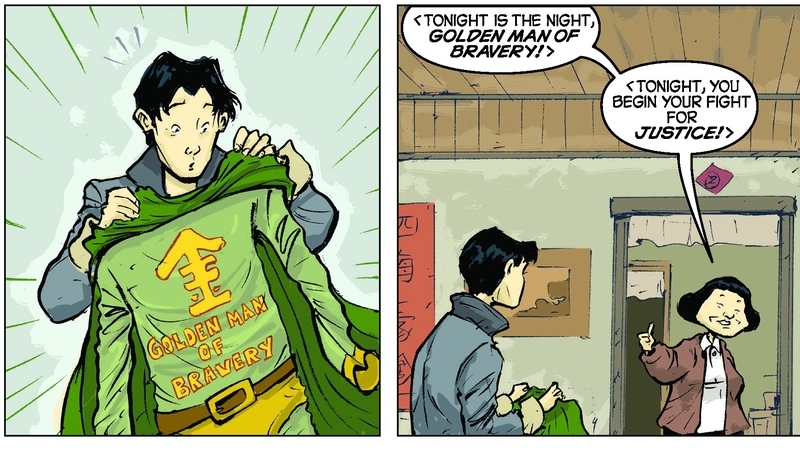 Gene Luen Yang creates an origin story for a forgotten, subversive character from the Golden Age. 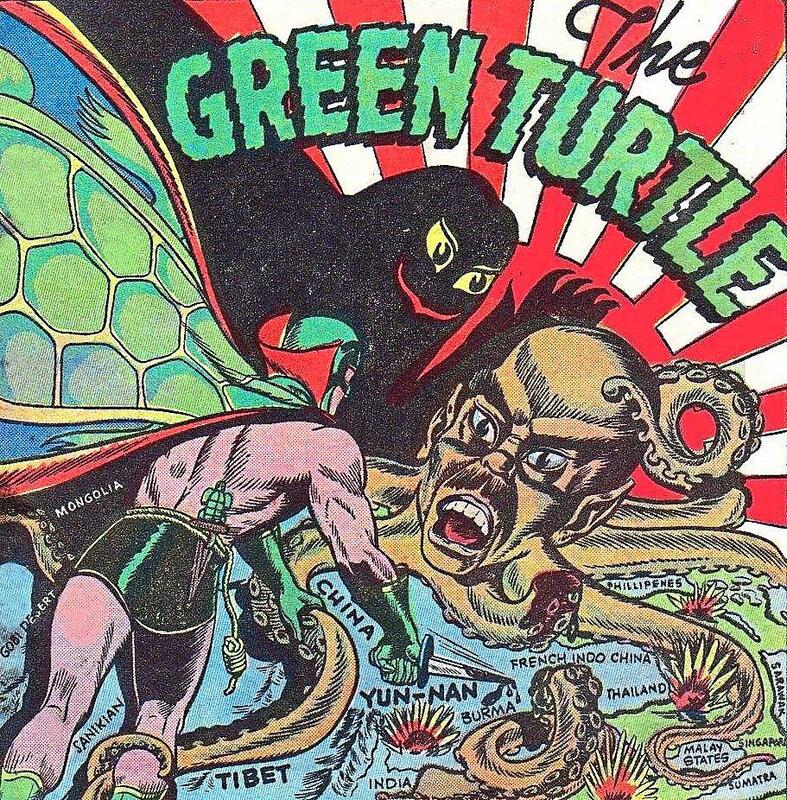 The Green Turtle! It’s fair to say that he has found a golden nugget from that era. AUTHORS NOTE: I am embarrassingly behind on write ups. The others have kept up pretty well but I’ve spent the past year just not bothering. So here is a listicle version of everyone’s thoughts on the book. These are the literal notes from the night, which I’ve edited for any faux pas. Breath of fresh air and uncynical compared to Mark Millar. Didn’t know any background - a mystery until the end. Doesn’t need the revival story - works as it’s own thing. Felt like a story working for itself. Not a character you see in comics much. Family relationship: heavy on that like Ms Marvel. Bit cartoonish, didn’t love the art but didn’t put me off. The whole sequence of pushing the boy into chemical concoctions - funny. Thing not normally fond of. …but in the background. 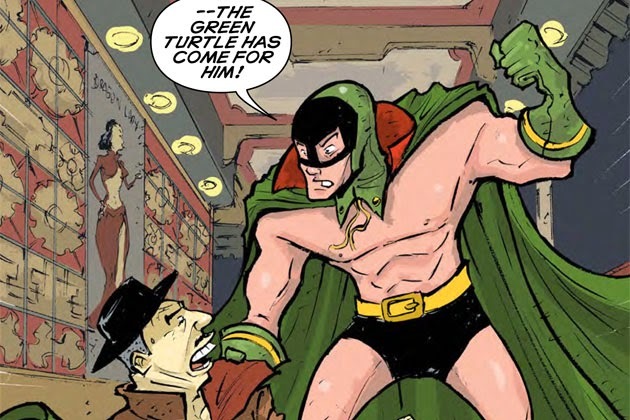 Father gets killed and he turns into a super turtle. An uninteresting character but didn’t need whistles and bells. Fight scenes with tortoise giving instructions - brilliant/great. …looking back over treatment, seeing the back a lot and similarities. Series of 5 issues is enough. Loved setting of 40s World. Cute romance but not necessary. Read in one lunch time - easy. A lot like Jake…not a massive amount… not because awful or hated it. When I looked at it, wondered whether I would connect. Extremely funny in some parts. Not lol’d at things that are culturally different just funny situations - witty. Art - not my scene. Chew - people very much like the same in that. Interested to know from anyone who insight into Chinese families if the archetypes are real or how much blown out of proportion? An archetype that must exist for a reason. The kung fu uncle loves her. Son does even she is weird and stand offish. …as in I map my own experiences to it, like in divorcing parents I cannot stand infidelity. But relationships here are so unfamiliar that I’m forced to look at it from outside. Bizarre why he puts up with her - no emotional feedback but still devoted. Making her smile but is heartbreaking. Jake says that felt really real: drawn on something. Honest, not stretching too far or too clever. A yarn with a different spin. “Really made me want to watch Big Trouble In Little China which can only be a really good thing”. What’s with the obsession about the mother’s bosom?!? I would’ve read it again myself… except Kelv had to borrow my copy! Missed first time: we see the Dad’s shadow, Turtle fulfilling the promise. Both creators have books on Tom’s list. Boxer’s and Saints - I will definitely go and read. Charlie Chan’s Art of Hok Chye. Hadn’t heard of this one. Really do have an issue with the big heads. Will follow up on writer but not artist. Just a style thing, calms down to a degree, settles on just the Mum. A little too close to Rob Gilroy’s Chew which most of us don’t like. Read in 2 passes, as most of us - wanted to read it. Not been able to watch much telly, but more time to read and this one was wanted. Great touches how bullets scoot around. Despite disliking how he designs people, storytelling approach is very good. Dad death is a full page panel. It’s dense yet reads really, really easily. Jake loves all the silhouette work. Even though the dragon has a nice rivalry, the others weren’t needed. Really, really thoroughly enjoyed it. If not for the art, it would’ve been a 5. Art and culture feel genuine. Hate how she treats son and husband. Back story intriguing. Love the subversiveness. 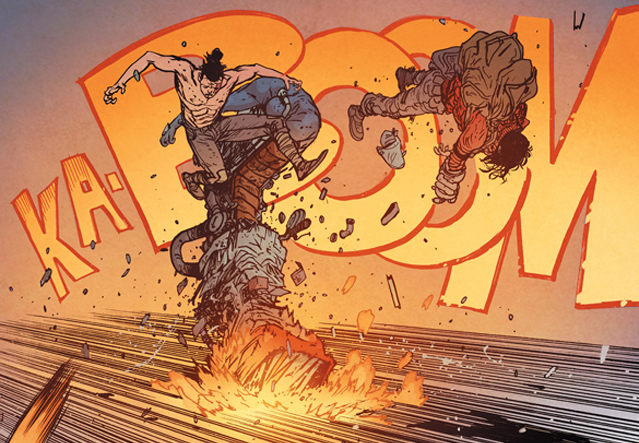 I didn’t really like the art either but enjoyed the story immensely. © 2019 The Comic Book Club. Powered by Jekyll using the HPSTR Theme.